I got a lathe for Christmas. I had this in mind for at least two years, but never managed to accrue the funding for it. Now it’s mine! All mine! So I had this nest of saws with the blades that each fit on the handle, but only one at a time. 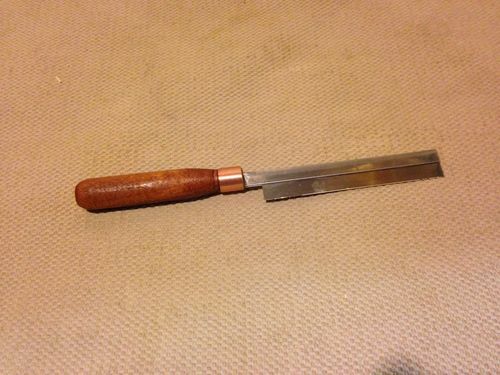 I want to put all the blades in handles for ease of use and felt this would be a good beginning lathe project. Everything went well, except that I forgot to put two grooves in the end to maybe help it match the commercial models. Ah well, next time! I need to make the shank socket longer as I cracked the handle putting the blade in. It’s still useful though. Not that I count this as a project, but the wood is scrap mahogany and the finish is boiled linseed oil. Thanks. So far I haven’t fallen down the ‘rabbit hole’ with this, but it is a different thing to try. I need to build a proper stand for the lathe. I disagree with your statement: Not that I count this as a project, but the wood is scrap mahogany and the finish is boiled linseed oil. Many of a project is in the creation of a tool, and besides, aren’t projects when you make something useful? Repurposing the wood is good too, waste not – want not. 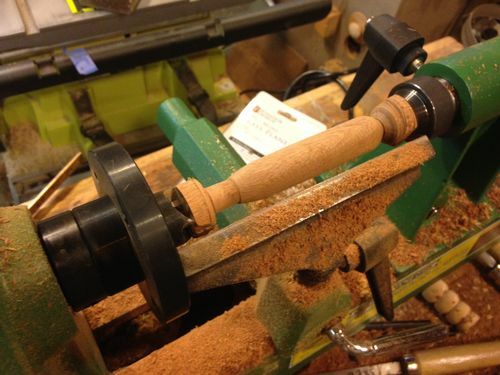 Nice work, have fun with your new lathe. Many of a project is in the creation of a tool, and besides, aren t projects when you make something useful? Repurposing the wood is good too, waste not – want not. Maybe the next one will turn out right. A very good start, oh your going down the vortex you just don’t know it yet. Have fun with your new lathe.